Here’s my delicious twist on classic strawberry rhubarb pie baked in toasted caraway tart shells and loaded with pillows of meringue. In a food processor, pulse the all-purpose flour, powdered sugar, toasted caraway seeds and salt until combined. Then, add butter and pulse in short bursts until the butter is the size of small peas. Slowly add the beaten egg and pulse until the mixture begins to stick together. Remove and shape the dough into a disk, wrap in plastic wrap and chill for at least 2 hours. Let the dough sit at room temperature for 10 minutes, then roll out to about 1/4 inch thick on a lightly floured surface. Use a large round cutter or a knife to cut out circles of dough for each tart pan (I used 5 inch circles for my 4-inch tart pans). Grease tart pans with butter, then press the dough circles into each pan. Chill in the freezer until ready to bake. Toss all ingredients together in a bowl to coat the fruit. Then cook the mixed ingredients in a medium saucepan and over medium heat. Stir frequently until sugar is dissolved, the mixture is moistened, and the strawberry and rhubarb start to soften. Divide the filling between the 8 tart shells. Once filled, place on a sheet pan and bake at 400 degrees F until filling is bubbling and the dough is golden, 15-20 minutes. Let cool completely, and then remove tarts from their pans. In the bowl of a stand mixer fitted with a whisk attachment, beat the egg whites until foamy. Slowly add the sugar to the egg whites while continuing to mix. Beat to stiff peaks. Spread meringue onto the tops of each tartlet. 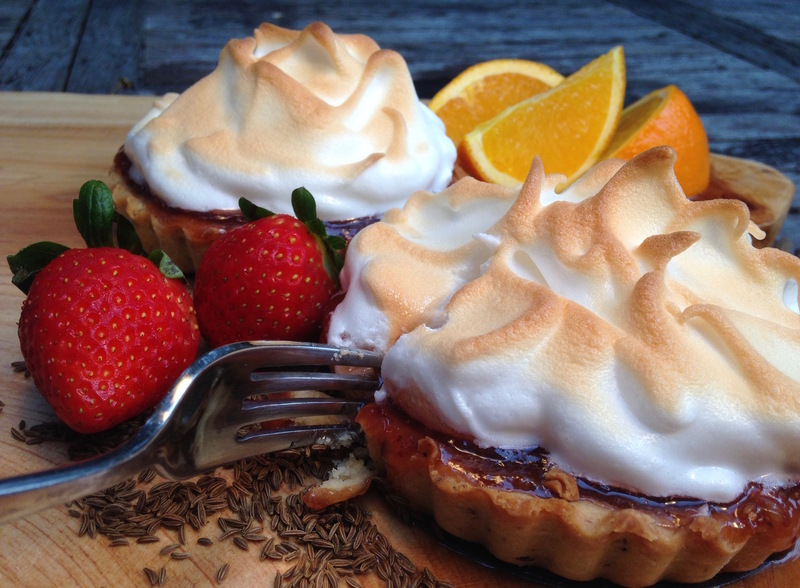 Brown the meringue with a hand-held kitchen torch or under an oven broiler (watch it carefully). Serve immediately. Store any leftover (who are we kidding) tartlets in the fridge. Note: This recipe can be baked as two 8 or 9-inch tarts. Follow instructions as given, substituting large tart pans for 8″ smaller ones. Increase baking time to 35-40 minutes. Savor while sipping on chilled caraway liqueur as a digestif!